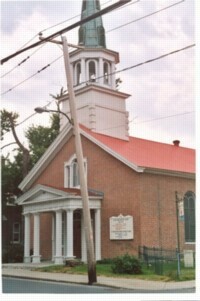 Thomas and Mary's son John Martin Morrissey married Edith Sweeney on 15 May 1895 at Saint Anthony's Church, "in the presence of William E. Flanagan, uncle of the bride" and "Thomas Morrissey, father of the groom". 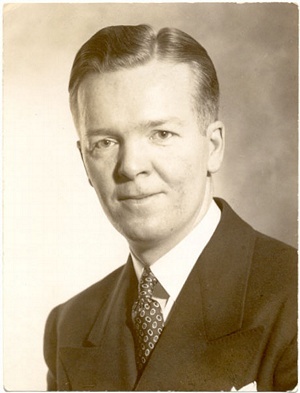 Martin Morrissey was named after his uncle, Father Martin Callaghan. He was known familiarly as Martin, as indicated on the 1891 Census; the custom of the family in some cases was to use the middle name as the everyday name of the child. Martin was also known as 'Banty', which obviously suggests a small physical stature. While I never met my paternal grandfather, I have many happy memories of my grandmother and of my uncles, especially my Uncle Alex and Aunt Ivie. My parents, my brother and I, lived with my grandmother from around 1952 to 1954 when my father was ill. My grandmother loved her children and placed her children and her family first in her life. Her door seems to have always been open to relatives who needed a place to live. She encouraged her children to continue with their education and paid the tuition for my father to attend St. Leo's Academy. My father, like his mother who played piano, and several of his other siblings, played a musical instrument. He belonged to a band that his brother Herb organized and they performed at many venues in Montreal. It was a home of family gatherings, music, laughter, playing cards, and an interest in sports. Martin played lacrosse and their son Frank Morrissey was involved with organizing amateur sports in Quebec. 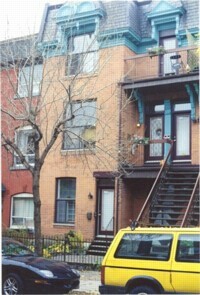 After Martin and Edith married they lived at 572 (now 3072) St. Antoine Street in what was then St. Henri. This is a street level flat exiting directly onto the sidewalk on the south side of the street, a few hundred feet west of Atwater Avenue. In 1907 they moved around the corner to another street level flat, at 94 (now 1094) Marin Avenue. These are attached buildings of two or three floors, all grey stone or red brick exteriors with outdoor stairways for the upper flats. Edith's parents lived at 536 Greene Avenue, which is just around the corner from both of the residences where Edith and Martin resided between 1895 and 1926. Martin and Edith moved from Marin Street to a six and a half room upper flat at 238 Girouard Avenue in 1926 or 1927; this address was renumbered to 2226 Girouard Avenue in 1930. Located in the west end neighbourhood of Notre Dame de Grace, this is where I used to visit my grandmother in the 1950s and 1960s. At some time in the 1930s the street was widened, eliminating front lawns and making Girouard a busy through-street along which streetcars ran to lower N.D.G. until around 1959. Other relatives lived across the street from 2226 Girouard, possibly the MacDonalds. Martin and Edith had three daughters, Mabel, Stella, and Elsie. Elsie and Stella both died young, and Mabel remembered with sadness the absence of her sisters, especially Elsie who was only one year her junior. Mabel Morrissey worked at the Bank of Montreal where she was popular with her colleagues. Otherwise, she lived a quiet life at home with her mother and family. I have yet to meet a person who knew him and didn't like him. He had that exuberant spirit which could not be broken, even by adversity. And a 'squarer shooter' with his friends never breathed. Throughout his career as a sport executive he worked like the proverbial Trojan. Much of the foundation of the present amateur hockey structure in Quebec was built by the tireless effort of this diminutive live-wire'. Let us pause just a moment to think of this gallant little man who, to my knowledge anyway, never had a real enemy. William Morrissey worked most of his life for Dawson Company. He and his wife Lil Bateman lived for many years at 397 St. Aubin Street, in Ville St. Laurent. They had one son, Bill Morrissey who served in the Canadian army in World War Two; he fought against the Germans in Holland. Lil Morrissey told my mother about her son's terrible war experience, which she read about in his letters from Holland. Bill junior and his wife divorced and their daughter Joanne was raised by her grandparents, William and Lil. Alex Morrissey and his wife Ivy had one son, Herb, who became a well-known magician and who owns a company in Toronto that sells magic products. Alex worked as a salesman and he and Ivy spent their summers at a cottage they shared with his mother Edith and sister Mabel. 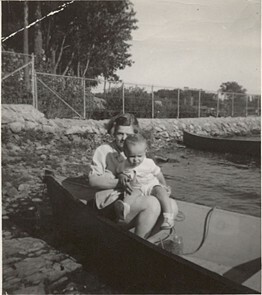 For several years my mother rented a cottage across the street from theirs and while my mother was at work, my grandmother and Aunt Ivy kept an eye on my brother and I.
Herb Morrissey married my aunt Dorothy Magrane in 1939. For a few years they lived a few doors away from us on Oxford Avenue. They had two children, Linda and Bob. I will discuss my father, Edgar Morrissey, Martin and Edith's youngest son, in the next chapter. Martin Morrissey died after suffering a stroke at Windsor Station, probably on Wednesday, 10 February 1932. He was buried at Notre Dame des Neiges Cemetery on Saturday, 13 February 1932. Martin and Edith were married for thirty-seven years. Eileen Oakes writes that Martin Morrissey "always worked for the C.P.R. telegraph, in fact took a stroke in his office and died the same day." 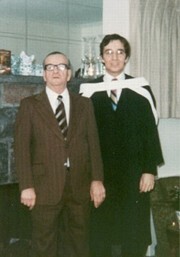 My father also worked at Windsor Station and could have been present when his father died, or soon after. 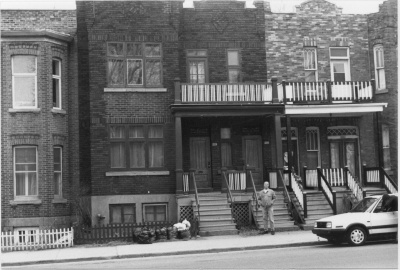 My grandmother, Edith Sweeney, continued living at 2226 Girouard Avenue until her death in April 1965; she had a cold the previous February, and this developed into pneumonia from which she died at the Queen Elizabeth Hospital only a few blocks from her home. Her two sisters, Essie and Edna, continued living at the flat until it was no longer possible because of their advanced age. 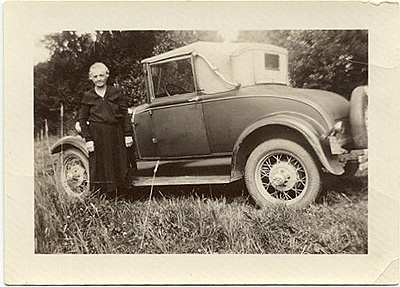 Essie died in July 1968; Edna entered an old folks' home near Ottawa until her death in January 1970. While Edith is buried in the Morrissey family plot, with Martin, at Notre Dame des Neiges Cemetery, Essie and Edna are both buried at Mount Royal Cemetery. Essie is buried with the other Sweeneys, in the plot purchased by her father, while Edna is buried about fifty feet from where my father is buried. 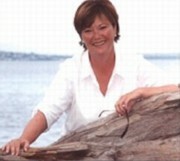 Jo-Ann Morrissey Steen, granddaughter of William Morrissey and Lillian Bateman, now of White Rock, B.C. Children: Linda and Robert have five children between them, they are Kimberley, Marnie, Donna, Jim, and Dan. Edith Sweeney's mother, Margaret Flanagan, was the daughter of Mary Barron and Murtagh Flanagan. An Irish friend informs me that the name Murtagh is "common in Roscommon", an inland county in the northwest of the Irish Republic, and is the name of one of the three kings of Tara. Murtagh, in Irish, means "skilled at sea craft" and today the name might be "Mortimer" for English speakers. Mary Barron was buried at Notre Dame des Neiges Cemetery on 26 June 1906 and was predeceased by her husband, Murtagh Flanagan; however, I don't know where Murtagh is buried. Murtagh Flanagan and Mary Barron, Edith's maternal grandparents, had at least four children. There was Margaret Flanagan, Edith's mother. Another child was William E. Flanagan, Edith's uncle, who was a witness at Edith's wedding; he died on 10 December 1927. A third child was Edith's aunt, Elizabeth Flanagan ('Aunt Lib') who had a career as a journalist; she married a Ryan, which may have been a second marriage. Aunt Lib lived at Girouard for a few years until her death on 3 January 1944; her son moved to St. Louis, Missouri and she planned to move there but upon visiting found the climate too humid and returned to Montreal. She is buried with her mother next to the Morrissey family plot at Notre Dame des Neiges Cemetery. 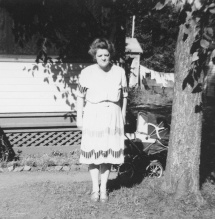 Finally, there is Ann Mary Barron Flanagan, who was buried on 20 October 1950. She married Joseph William Dowling on 29 October 1890. The Sweeneys and the Barrons were very close, so much so that Edith considered the name Barron as one of my father's middle names. There are also several other family members who have "Barron" as one of their Christian names. While the Barrons were Catholics, the Flanagans and the Sweeneys were Protestants. My grandmother's parents, James Sweeney and Margaret Flanagan were married on 7 July 1875 at Erskine Presbyterian Church in Montreal. Edith Sweeney's father, James Sweeney, was the son of Mary Gallagher and Daniel Sweeney. At James and Margaret's marriage, Daniel Sweeney, the "father of the groom", signed the marriage certificate as a witness. Margaret Flanagan was of the "age of majority" which at that time was twenty-five years of age. Daniel was born in Ireland in 1816; he died of "cerebral apoplexy" and was buried at Mount Royal Cemetery on 8 February 1888, age 72 years. 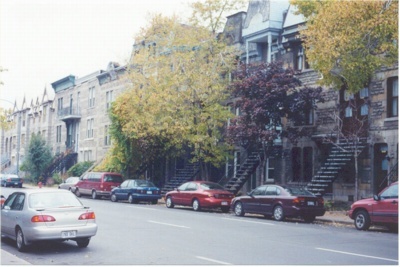 At that time he resided at 153 1/2 St. Charles Borromee Street in Montreal. Daniel worked as a tailor in 1845 when, according to Lovell's Directory, the family lived at "Ste Catherine and Bleury". In Lovell's 1861-1862 edition he was still working as a tailor but had moved to 22 Hermine Street, Montreal; in 1868 the family lived at 107 St. George Street. Daniel's wife, Mary Gallagher, was born in Ireland in 1814 and died of "consumption" (tuberculosis) on 14 December 1860 at age 46. James Sweeney, my grandmother Edith Sweeney's father, lived his final years with Edith at 2226 Girouard Avenue. James was born in 1852 in Montreal; he died when he was 85 years old of "uremia coma and chronic nephritis" on 11 January 1937. In 1864-1865 he and his family lived on Tannery West and worked as a labourer; in his final years he worked in a tobacco store. He is listed as the owner of the Sweeney family plot at Mount Royal Cemetery. 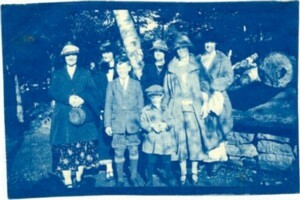 An early photo of the Sweeneys; Edith Sweeney Morrissey, possibly first on right, her son Herb Morrissey third from left; Edith's sister, Essie Sweeney third from right; perhaps another sister, Clara Sweeney, first on left. 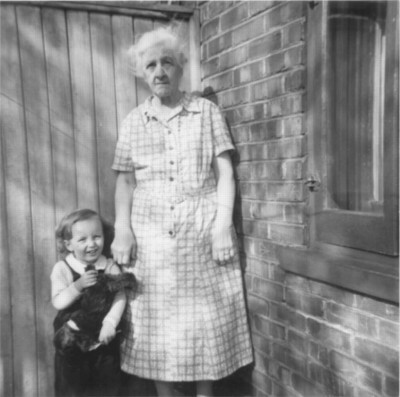 The other younger woman and small child are unidentified; photo taken around 1922. James Sweeney's wife, Margaret Flanagan, was born around 1851-1854 in St. Johns (present day St. Jean-sur-Richelieu), Quebec about twenty miles south-east of Montreal. Margaret was baptized at the Anglican church in St. John's, Quebec and was later, like her husband, a Reformed Presbyterian. 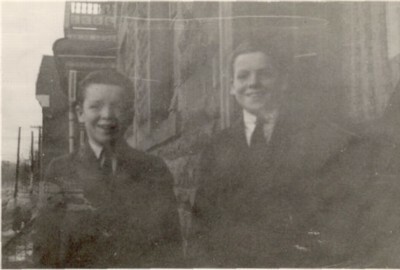 Margaret Flanagan's mother, Mary Barron, was Roman Catholic and this would account for why several of James Sweeney and Margaret Flanagan's children were baptized at the Roman Catholic La Cathedrale in Montreal (formerly St. James Cathedral, and as of the early 1950s Mary Queen of the World Cathedral). Margaret died of "pernicious anemia" at age 72 years on 4 January 1926 and was buried on 6 January 1926 at Mount Royal Cemetery. According to the 1881 census, Margaret Flanagan and James Sweeney lived in the St. Louis Ward, Montreal where James was employed as a book keeper. By then they had three children: Edith Mary (my grandmother) who was born in 1876; Clara, born in 1877; and their first son, Frederick who was born in 1880. The former are all listed as being Reformed Presbyterians. Also living with them was Margaret's mother Mary (Barron) Flanagan (born 1829) and two of Margaret's siblings, William Flanagan (born 1874) and Marianne (Ann Mary) Flanagan (born 1859), who were Roman Catholics. This also suggests that Murtagh Flanagan, Mary's husband, was deceased by 1881. If James was the sole breadwinner, he was supporting two families. Buried: 25 June 1906 at Notre Dame des Neiges Cemetery, Montreal. Married: James Sweeney on 7 July 1875 at Erskine (Pres.) Church in Montreal. Note: He moved first to Riviera, California; his last address was at 91006 Arcadia Street, Los Angeles, CA; Fred stayed in touch with his sister Edith Sweeney until her death in the mid-1960s. 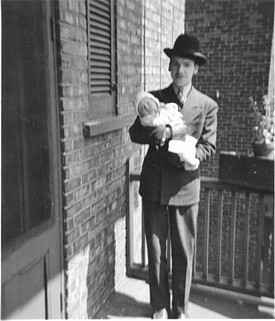 Children: one son who moved to St. Louis, Missouri in the 1930s.